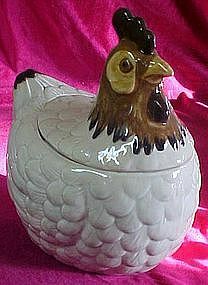 Adorable Oragiri chicken cookie jar. Made of hand painted glazed ceramic. Measures 10 1/2" tall and is about 9 1/2" long. Nice condition with the exception of inside the lid are large slivered chips on the edge. Thus reflecting the low price. It does not affect the outward appearance at all. Still good and useable.